Here are two MPEG animations Elser's surface. 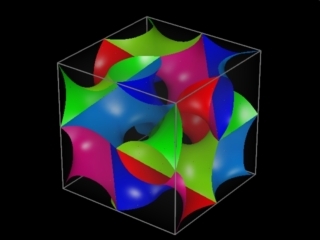 Both animations depict a unit cell of the surface. 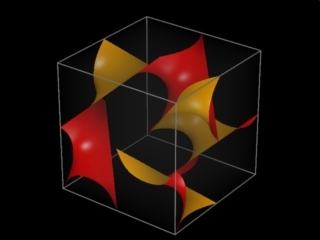 In the top animation, all three pieces of the surfaces are shown. The parameter tau varies between 0 and 120 degrees in one degree increments, and the color shifts so that the surfaces at 0 and 120 degrees are visually identical. In the bottom animation only one of the three pieces is shown. The parameter tau makes a 360 degree circuit in one degree increments.